Leica Microsystems launches the HyVolution true confocal super-resolution technology for the Leica TCS SP8 confocal microscope platform, extending its imaging portfolio in the sub-diffraction regime. HyVolution allows researchers to achieve everything at the same time: They can resolve structures down to 140nm with multiple colours, with high imaging speed, and high signal-to-noise ratio. HyVolution can be ordered with every new Leica TCS SP8 and is also available as an upgrade to existing Leica TCS SP8 platforms. "HyVolution is high-fidelity imaging for every sample and every experiment. When studying rapid dynamics of living cells, researchers do not have to make a trade-off between high resolution, imaging speed and the number of colors they want to acquire. For the first time, these parameters are available with maximum efficiency at the same time in a confocal microscope. This opens new areas for researchers," says Markus Lusser, President of Leica Microsystems. "Functional annotations of the genome require a deep insight into signalling networks. This often demands sub 200 nm resolution with multiple dye emissions. HyVolution bridges the gap between classic confocal imaging and STED super-resolution below 30 nm," explains Dr. Bernd Sägmüller, Director Confocal Laser Scanning Microscopy at Leica Microsystems. 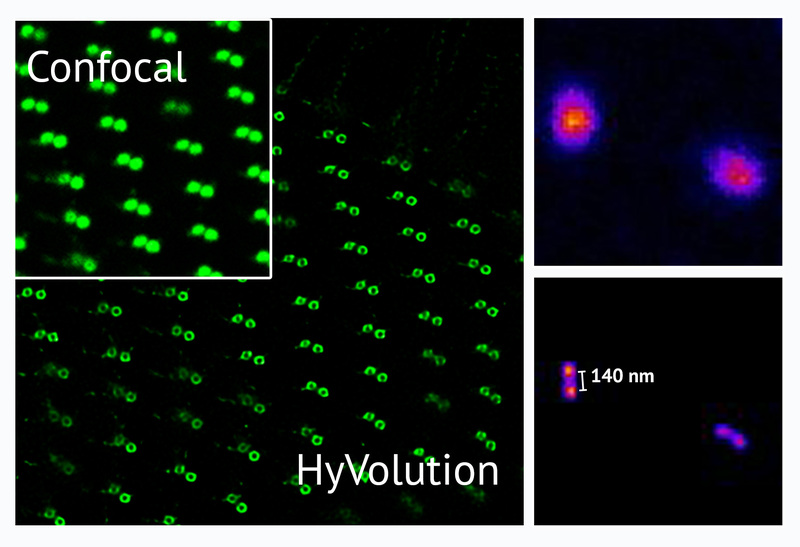 "HyVolution offers users multicolour super-resolution down to 140 nm with a confocal microscope at an affordable price." HyVolution is based on combinations of the Leica HyD hybrid detectors, a workflow-orientated software wizard, best-in-class Huygens deconvolution software embedded via a direct interface in the Leica Application Suite X (LAS X) control software and CUDA GPU-accelerated computing. Researchers benefit from HyVolution by imaging fast dynamic processes and capturing multiple colours simultaneously with the spectral detection system of the Leica TCS SP8 and still achieve 140nm resolution.